ProServ is designed to suit the specific needs of your business. 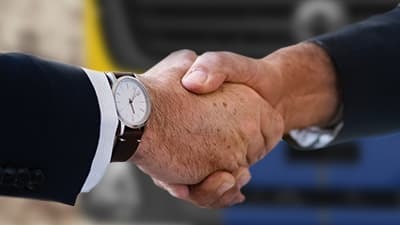 Its speedy, effective, reliable, ensuring that you only need to manage your business & concentrate on expanding it, leaving everything else about the truck to us. 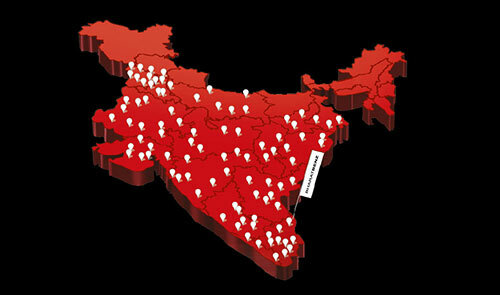 To ensure that all our services and facilities are easily available to you, we have created a wide network of dealerships, set up across 141 strategic locations, across India. So no matter where you are, we will reach you in less than 4 hours. We are extremely particular about the quality of service we offer to our customers. Our fully trained technicians are here to offer all round scheduled services to complex aggregate repairs with ease. 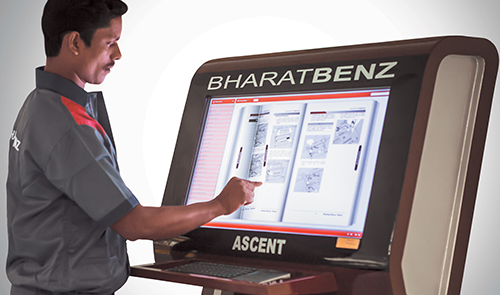 After Sales Central (ASCENT) is a touch-enabled, animated multilingual single interface system available at our workshops across India which provides details about the functioning of every aggregate used in a BharatBenz truck. 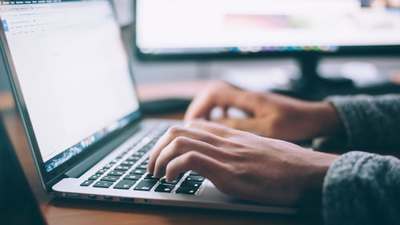 This is to ensure that our service technicians always have ready access to the necessary information and can rectify issues accurately. We use specialized tools for tricky repairs and special equipment to carry aggregates repair across all BharatBenz dealerships. 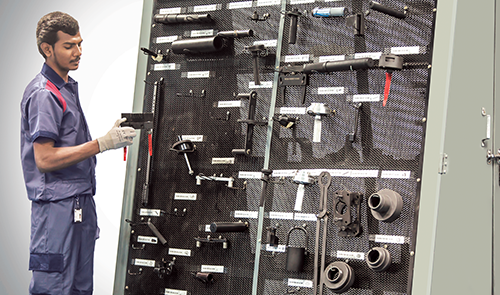 All this, just to ensure your trucks are handled with the best of care and the latest in auto repair technology. Since your trucks are almost always on the move and have little time to spare, our exclusive express bays are there for their immediate servicing needs. These bays are equipped with specialized tools & equipment’s allowing us to service vehicle faster, so that your driver along with your truck will face no delays & is back on road in no time. Speed fix further enhances turnaround time for minor repairs. 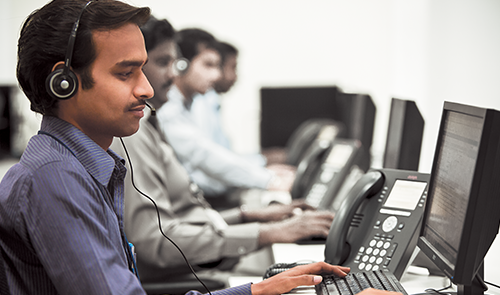 To enable Higher uptime we offer you Customizable service options at your doorstep based on your application ie. Container workshops, Dial – a – Service, Pool Service. 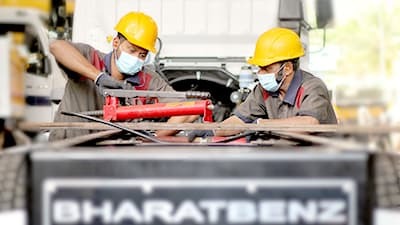 BharatBenz offers a widest choice of service packages for your vehicles to ensure all maintenance related needs and hassles are well-taken care of. These can be availed at any of our authorized dealerships. This is customizable for all models across applications for longest duration with exclusive financing facility and flexible payment options. 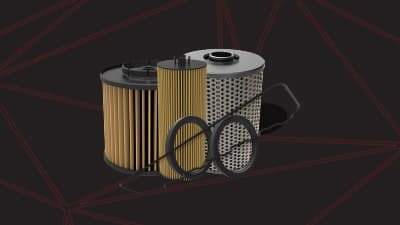 Extended Warranty is a highly cost effective and powerful product to further reinforce the Standard Warranty. It covers your entire *Drive line i.e. 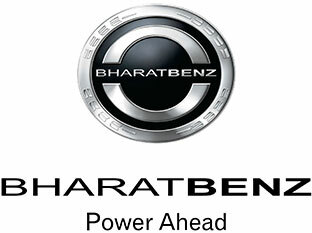 Engine, Transmission & Rear Axle for a longer duration and enhances the unmatched durability of BharatBenz vehicle. Diagnosis is the heart and soul of any repair process. 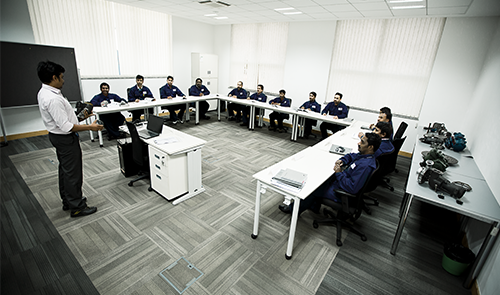 Our engineers at BharatBenz have developed an advance diagnostic system aided with troubleshooting which enables us to address problems quickly and effectively, also provides information on problems that may arise in the future. 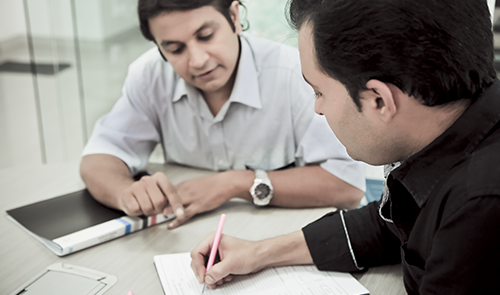 As a customer you will be able to eliminate unforeseen problems and are ensured complete ease of operations. 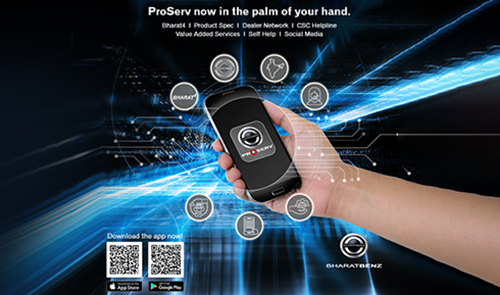 ProServ now in the palm of your hand at your ease and convenience which provides you all Comprehensive products specification & service support information at the tip of your finger. 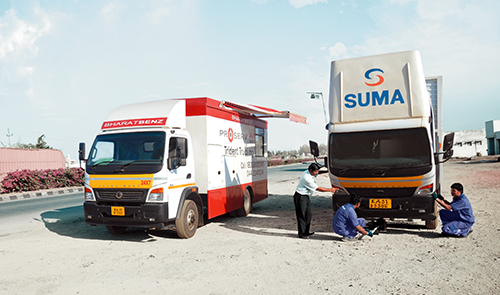 Our comprehensive customer care set-up ensures all your service needs are taken care of his includes a state-of-the-art Mobile Service Workshop equipped with BharatBenz genuine parts, genuine lubes and tools that can handle almost all kinds of breakdowns as well as a multilingual toll-free number to ensure 24x7 on-road assistance or technical support.